To cap off our mini-vacation to Eugene, Oregon, for sports and more, Wayne and I took an extra day to drive back to Bellingham along the Oregon and Washington coast. It's been a long time since I've been there, and Wayne had never been to some of the areas. We left Eugene on State Highway 99 heading north to Corvallis. From there we crossed the Coast Range on Highway 20 to Newport, Oregon. We've been to Newport quite a few times in 997, but this time we got to see the lush farmland and forested mountains up close. From Newport, we followed Highway 101 north with an overnight stop in Astoria at the Holiday Inn Express right on the Columbia River. The next morning we headed across the mighty Columbia on the huge and very long Astoria-Megler Bridge over the river's mouth. Highway 101 weaves in and out along Washington's west coast. The Pacific Ocean was a brilliant blue with large white breakers on this warm spring day in May. A few clouds started to dot the sky as we travelled farther north. If you look close, you can see small lenticular clouds over the tops of the puffy while cumulus. This is a sign of turbulence and a hint of the coming storm. 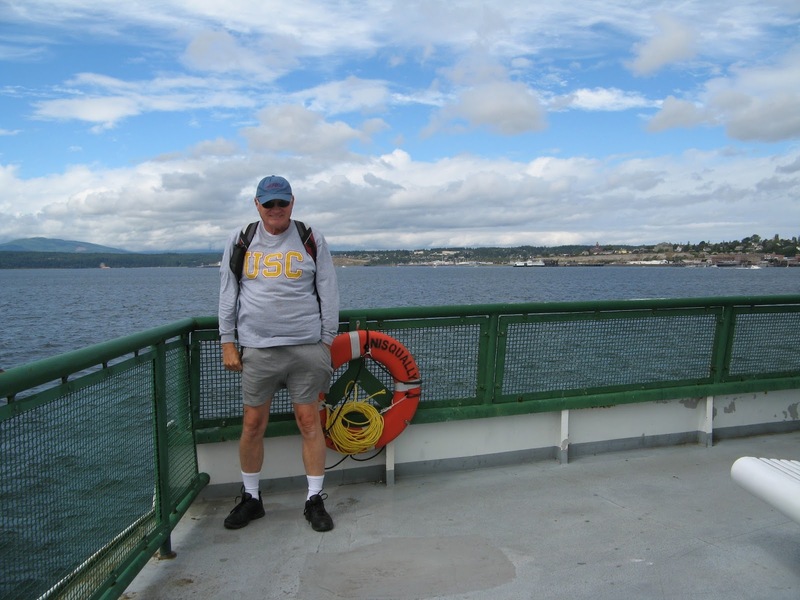 We had to rush a bit to catch the 3:30 ferry from Port Townsend to Whidbey Island. Sure wish the ferries in British Columbia were as inexpensive. Our car and both of us travelled for less than $12.00. Back home it would be more like $35.00. We stopped in Oak Harbor for dinner at Seabolt's Smokehouse. We shared the Captain's Platter for Two and watched lots of locals coming in to buy fresh fish and shrimp. We'll be going back again for sure. 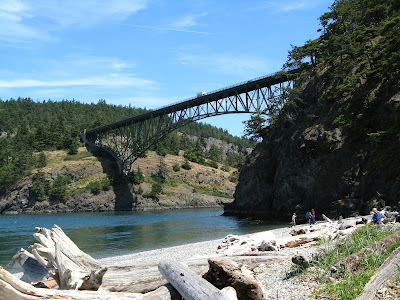 The last leg of the drive up Whidbey Island took us over the picturesque Deception Pass Bridge. Even this early in the season there were lots of tourists parked along the road to catch a glimpse of the rapids running underneath. This looks like such a scenic area I'd love to visit! Thanks for sharing the great views on your trip! What a great trip - we know the route well. My cousins live in Newport - beautiful area. It is interesting that you find the WA ferries cheap - we mostly complain because the prices keep going up. A ride over to Lummi Island and back is 20.00 for a car and two passengers - and the trip takes 5 minutes. Glad you had such glorious weather for your trip. The Pacific Northwest is an area I haven't traveled through...I've been to Eugene, driven to the coast and then south back to California...This area is on my list of places to go!! !